TSA PreCheck Expands to 16 Airlines — Get It Now! 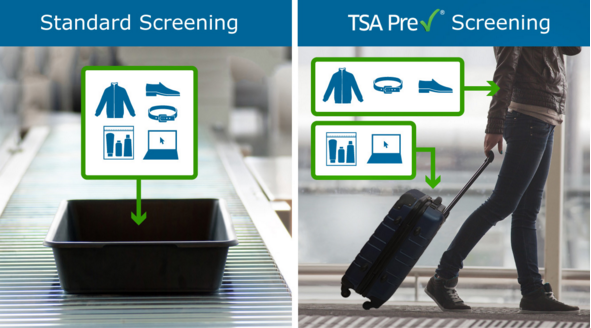 TSA PreCheck is a service that includes a background check and other vetting in order to gain access to a separate airport security process with less invasive techniques. For example, you can generally leave your shoes on, leave a light jacket on, and keep all liquids and electronics inside your luggage. Some agents have their own interpretation of the rules — like when one castigated me for not removing the same light jacket I’ve worn for two years — but otherwise it works pretty well. There are three major issues with PreCheck that can make it difficult to use if you aren’t familiar with the process. I’ll address each in turn. You need to enroll first. You need to be flying on a participating airline. You need to visit an airport that offers PreCheck. Enrollment is simple. You can apply online even if you aren’t a U.S. citizen. It costs $85 for five years. If you consider the time you would waste in line on just one round trip journey each year, I think you’ll make it back. Whichever method you choose, you’ll get a Known Traveler Number that you must include in your reservation. It’s usually located near the passenger name field. Some passengers check in with a non-participating airline when they have a long itinerary with multiple carriers. An example is checking in with Cathay Pacific in Hong Kong, then connecting to American Airlines upon arrival in the U.S.
PreCheck is still an option. Make sure you visit the American Airlines counter (or whichever airline you’re flying) to add your Known Traveler Number and print a new boarding pass. Five or ten minutes spent checking in again is worth saving an hour at security. After a trial period when just about anyone and his pet llama was permitted to use the PreCheck line, gumming it up with people who didn’t know what they were doing, PreCheck is now back to authorized users only. However, staffing issues have sometimes resulted in long lines. Also, not every airport offers PreCheck. Usually this is not a problem. There are over 160 airports that offer PreCheck. In those rare cases where I find an airport that does not, it’s usually a small one that doesn’t have much of a line, so PreCheck isn’t really necessary. However, do try to keep track of where the PreCheck options are located at your home airport and at other airports you visit frequently. When I fly out of Seattle, I’m usually on Alaska Airlines, but I tell the driver to drop me off at Delta because their station is closer to the PreCheck line. If you’re traveling out of an airport with a dedicated international terminal, know that most of these do not have PreCheck lines because so few international airlines participate. However, you can sometimes clear security at a domestic terminal and then walk through an airside connector. Examples include the connector between T3 and Concourse G in San Francisco and the connector between T4 and TBIT in Los Angeles. Despite the enrollment hassle, and the sometimes capricious decisions of the agents who staff these lines, I still think PreCheck is an essential part of travel. With reports of two- and three-hour waiting times at my home airport in Seattle and other airports nationwide, I have yet to wait more than 15 minutes when a PreCheck line is open. Getting more people to enroll in PreCheck not only makes the service work better for everyone, but it also makes travel a more enjoyable experience for you. You won’t be nearly as harried and frustrated by the time you reach the gate.